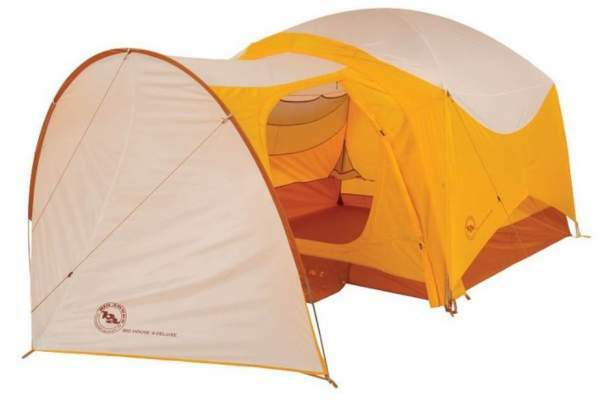 Big Agnes Big House Deluxe Camping Tent 6 Person is a fully freestanding and very tall structure with two doors and very strong aluminum poles for 3-season camping and hiking. 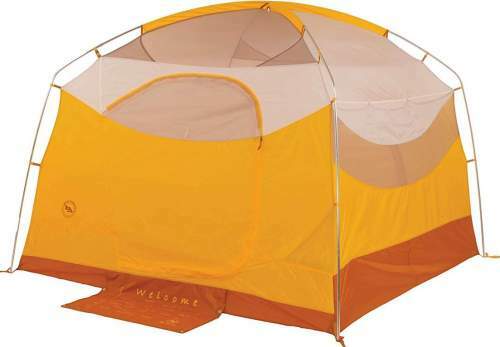 Big Agnes Big House Deluxe Camping 6 person tent – the front door with a welcome mat. Steep walls for lots of volume. 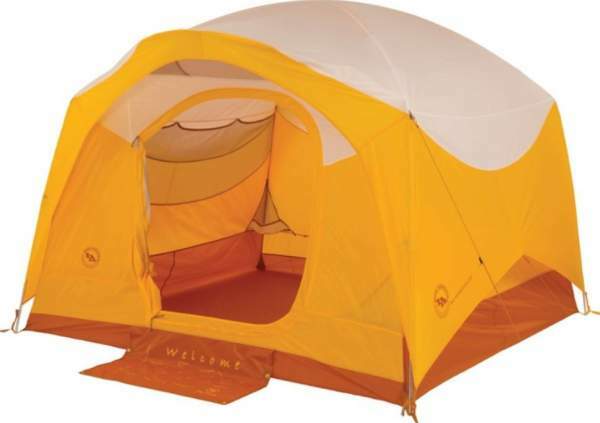 This tent is available on Amazon and the link will direct you to your local Amazon store. So if it is available there, you might save a lot on shipping. This Big Agnes Big House Deluxe Camping Tent is a part of a mini-series which includes this 6-person tent and a 4-person tent. Both are available on the same link given above. You will notice two different colors, the green is a more recent one but there are no differences in the specifications and features. This is a fully freestanding tent. This implies a partial coverage fly which clips to the corners. So the two doors on the opposite sides are without vestibules. This is both good and bad. The good is that the entry is easy, in particular in view of the height of the tent which is 78 inches (198 cm) and the doors. The bad is that you do not have any storage area for your larger equipment, but there is a huge number of wall pockets (more below). The tent is built in the dome style but you have the four corner poles that are almost straight. They are also pre-bent so the tent offers lost of volume, and the feeling inside is far different from a standard dome style. I find it similar to the Kelty Sequoia 6 Person Tent so you will see below how they compare. 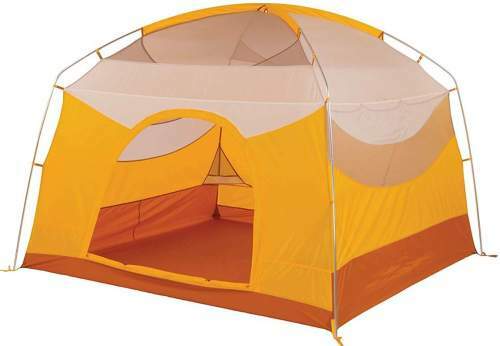 This is the tent in another color – the back door without the brim. Capacity-wise: The declared capacity here is 6 people so let’s see what this tent offers. 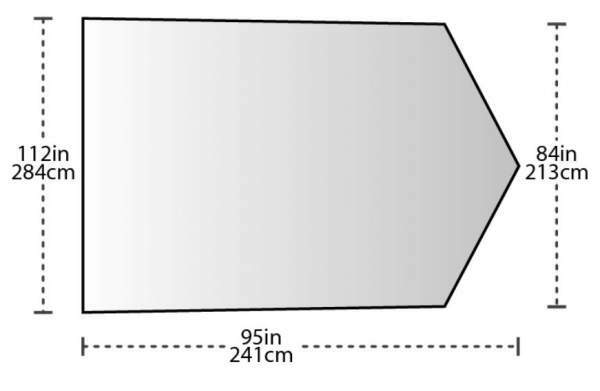 The picture below shows the floor plan and its most important dimensions. You have 75 ft² (7 m²) so if the tent is used by 6 people this would give 12.5 ft² (1.17 m²) per person. This makes no much sense to me, the tent is without any storage area and you would not have protected space for gear. So as a camping tent, this is a tool for a couple, or for parents with one or maximum two kids. In such a case you could keep lots of your stuff in the car. The floor plan and the dimensions. Weight-wise, they use the term trail weight (see more below) which in this case is 12 lb 8 oz (5.67 kg). So this is a lightweight construction and it qualifies the tent to be included in my list of backpacking 6-person tents. Though the packed size is not particularly great (see in the specifications below), but if the elements are shared among the users, this tent could be carried on some shorter hiking tours. Seasons-wise, they describe it as a 3-season tent. This is probably correct, the waterproof rating is reasonable, the poles are quality materials and very thick, and the fabric is good. But the tent is very tall, and the fly does not go to the ground on the sides with the doors. So although you have plenty of stakes to secure the tent properly, I would not use it anywhere where strong winds are expected, this holds also for areas above tree lines so do not plan to use it there. There is lots of mesh so it is not the best option in a cold environment. The tent comes with aluminum poles, the two main are 14.5 millimeters diameter and the short brim pole is 8.5 mm. So these are really thick poles with press fit connectors, which is surprising in view of the tent’s weight. The pictures below show the tent without the fly so you can see that the walls are almost vertical and the poles are strongly pre-bent. The tent comes with a full set of 10 aluminum hook stakes. The fly, body, and floor are all polyester with a 1500 mm waterproof polyurethane coating on exposed areas. The mesh is also polyester. All seams are taped with a waterproof, solvent-free polyurethane tape (No PVC or VOC’s). The tent attaches to the poles with plastic clips and sleeves. The fly is with buckles and you attach it to the frame, this is what makes the tent completely freestanding. There are two of them and they are a bit different and asymmetric in the design, see the pictures below. Both have mesh and panel sections but they are different in size (compare the green version above and the front door in the picture below). The front door roles to the side and the back door roles to the floor. There is a brim supported with a pole but this is only above the front door. This is why the front door is higher. The front door also has a welcome mat and you do not have it on the back. The front door is taller and with a mat. The back door – lower and rolls to the floor. There are no floor vents here. Bear this in mind if you plan to use it in a warm area with lots of rain, you will have to keep the panels closed and this can become a problem in long rainy hours. Quick Stash on front door to keep it out of the way. Zippers are with storm flaps. The tent comes with several layers of pockets, 10 mesh pockets in total, 2 bin pockets. Side wall pockets are sized for i-pads. You have stowable bin pockets that act as bedside tables. Velcro tabs are in place to connect the fly to poles. Pre-cut guy lines and tensioners attached to fly. Reflective guylines and reflective webbing. The carry bag is a briefcase-style, with shoulder straps and organizational pockets. 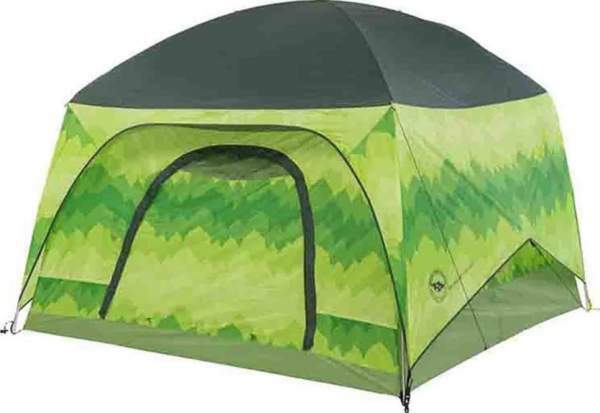 The tent fits Large Trapezoid gear loft from this brand – sold separately. Compatible with Big Agnes Corner Bar – sold separately. Big Agnes Vestibules for Big House Series Tents. Trail weight: 3 lb 2 oz (1.42 kg). Packed weight: 3 lb 9 oz (1.62 kg). Packed size: 22 x 4 in (56 x 10 cm). Height: 63 in (160 cm). Area: 50 ft² (4.6 m²). It comes with 8 lightweight aluminum hook stakes. This is the accessory vestibule floor plan and dimensions. The footprint is not included but they have it built and it can be ordered separately. It weighs 1 lb 3 oz (539 g). This is a polyester taffeta with 1500 mm waterproof polyurethane coating. 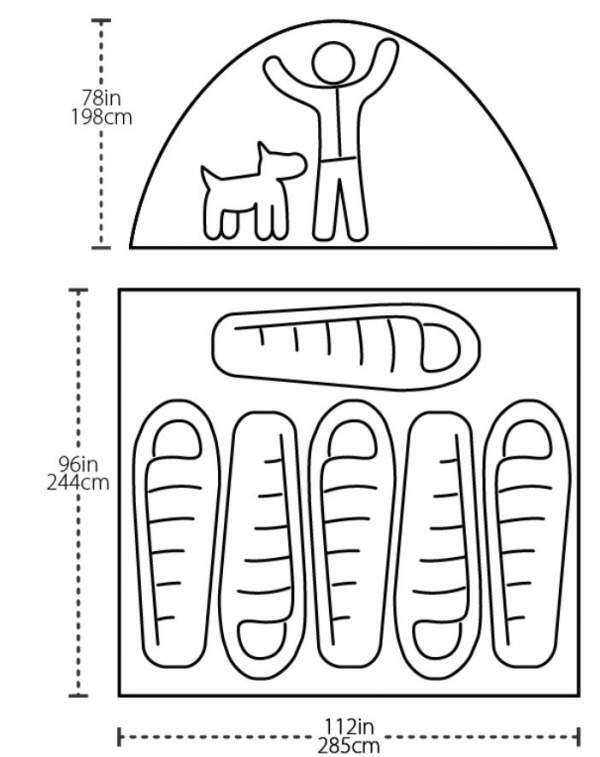 Big Agnes Big House Deluxe Tent Accessory Footprint. Far too small area per person. The Amazon price at the moment of writing this text is in the range $400 – 420. The green version is this upper range price. So the tent is expensive but the materials are high quality. You will see how it compares with some other tents below. Best use: car camping, hiking. Trail weight*: 12 lb 8 oz (5.67 kg). Packed weight*: 13 lb 11 oz (6.21 kg). Dimensions: 112 x 96 in (285 x 244 cm). Area: 75 ft² (7 m²). Area per person: 12.5 ft² (1.17 m²). Peak height: 78 in (198 cm). Packed size: 24 x 12.5 x 8 in (61 x 32 x 20 cm). According to a statement on Big Agnes site, the “trail weight” is the weight of the tent components necessary for setup and function. The packed weight is the weight with everything included with purchase. So the trail weight here should imply the inner tent, the fly, and the poles. I have decided to show you this Big House 6 tent side by side with two other 6-person dome tents. The Kelty tent is the only here with the full fly and vestibule, so clearly it offers far more protected area. But it is with steel poles so this is a camping tent. The Core tent has no vestibules but the inner area is much bigger, and it is much more affordable than the other two tents. In the summary of this Big Agnes Big House Deluxe Camping Tent 6 review, I can only stress again that this is a really well-built tent with quality materials and from a reliable brand. But this all comes at a price. If you can afford it, you will not make a mistake if you order it, just bear in mind a few objections I pointed out above. If you need more options, just search around in the site. This 6-person capacity group is particularly diverse and you have all possible shapes and sizes in this group. Check this unique Therm-a-Rest Tranquility 6 Person Tent with its two rooms and nice vestibules. Note that this is not a sponsored text. I am not paid by the manufacturer or related to them in any way. Do you have any experience with this tent? If so please share it here, there is a comment box below.